As far as is known, this was always the entrance to the Inn, leading from Fleet Street directly towards the central buildings of the early medieval Temple. A new gateway was built in 1610, when the house over it (No. 17, Fleet Street) was rebuilt by John Bennett, serjeant at arms. It was apparently rebuilt or renovated in 1748, since this date occurs with the initials T|CT, for Christopher Theed, Treasurer in that year; there is a pegasus carved on either side of the arch. 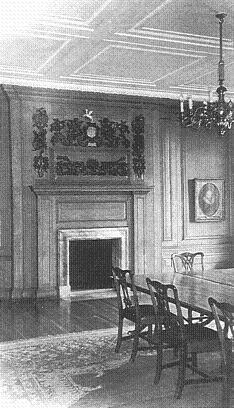 The principal chamber above the archway has contemporary panelling, and the plaster ceiling is decorated with the Prince of Wales’ feathers and the initials PH; it was reputed to have been the council chamber of Henry, Prince of Wales (d. 1612), and of Prince Charles (later King Charles I). The whole building was moved back, in order to widen Fleet Street, in 1905; on the inside of the archway are Edwardian carvings of pegasus and the initials T|HMB|1905, for Henry Mason Bompas. The house does not belong to the Inn. These chambers were built in 1858 by Sydney Smirke, after the demolition of some old buildings in Inner Temple Lane, one of which was dated 1657. The former No. 4 straddled the lane and adjoined the Church porch, with an archway underneath. The new name commemorates the residence of Dr Samuel Johnson at No. 1 (formerly called Black Buildings). Over the doorway of No. 2 are the initials and arms of John Arthur Roebuck, Treasurer 1857, and Russell Gurney, Treasurer 1858. The name of this court commemorates Nicholas Hare (d. 1597), one of four bencher brothers, and Treasurer in 1584, who built chambers here; it was previously called the Little Court, or Garden Court, and is perhaps the same as Nut Tree Court, called the ‘Nut Garden’ in Henry VIII’s time. It contained a well, with a pump. The original buildings here were named after various members who paid for their erection – for instance Crompton’s Building and Brooker’s Building – but after rebuilding in the seventeenth century they were all known by the name of the court itself. Only the chambers on the west and south sides open into the court; those on the west side also open into Middle Temple Lane and have passages leading through. Jeffreys had chambers at No. 3. The west range (Nos. 2-3) was rebuilt in 1679 after the fire of 1678, and again (to the design of Sir Thomas Jackson) in 1893-94. There are carved plaques on both sides of this range with the names and arms of Alfred George Marten, Treasurer 1893, and Arthur Cohen, Treasurer 1894. The Round of 1185, with the Templar effigies, and the Nave of 1240 with its finely proportioned columns of Purbeck marble, still present the same appearance as they have for centuries, though in truth the successive restorations have been heavy. Sir Christopher Wren fitted out the interior in 1682, and there were several alterations in the nineteenth century, principally by Sydney Smirke in 1842, when much of the building was remodeled, Wren’s fittings and the later monuments removed, stained glass inserted, and a conical roof added to the Round. In the air raids of 1941 much of the Church was wrecked, the Victorian woodwork destroyed and the monuments severely damaged. The columns were so badly cracked by molten lead from the roof, and then by the frosts of 1944-45, that they had to be replaced. An inscription records that the restoration was carried out by Messrs W. H. and W. E. Godfrey. Work on the foundations revealed an underground chamber next to the remains of St Anne’s Chapel on the south side. William Emmett’s carved reredos was brought back from the Bowes Museum, and the seating was rearranged on a collegiate plan. The new east windows are by Carl Edwards. The Round was reconsecrated in 1954 by the archbishop of Canterbury in the presence of Queen Elizabeth the Queen Mother (Royal Bencher of the Middle Temple); and the Nave in 1958, in the presence of Queen Elizabeth II, the Queen Mother, and the Duke of Edinburgh (Royal Bencher of the Inner Temple). A number of Inner Templars are commemorated by monumental inscriptions on the south side: John Selden (d. 1654), Sir William Morton (d. 1672), George Wylde (d. 1679) and William Petyt (d. 1707). There is an armorial brass for Lord Keeper Littleton (d. 1645), Treasurer of the Inn 1634-38. In the rubble after the bombing was found the armorial coffin plate of Sir Thomas Robinson (d. 1683), Treasurer 1680-83. The yard on the north side of the Church is notable principally for the monument of John Hiccocks (d. 1726), master in Chancery, with reclining effigy in robes; and that of Oliver Goldsmith (d. 1774): both Middle Templars. This building was known in the eighteenth century simply as an anonymous staircase near the Church porch. The association with the name Farrar is explained by an inscription formerly above the door (and preserved in a watercolour in the Guildhall Library), which recorded that after the fire of 1678 the staircase was rebuilt in the time of Thomas Farrar, Treasurer 1679. 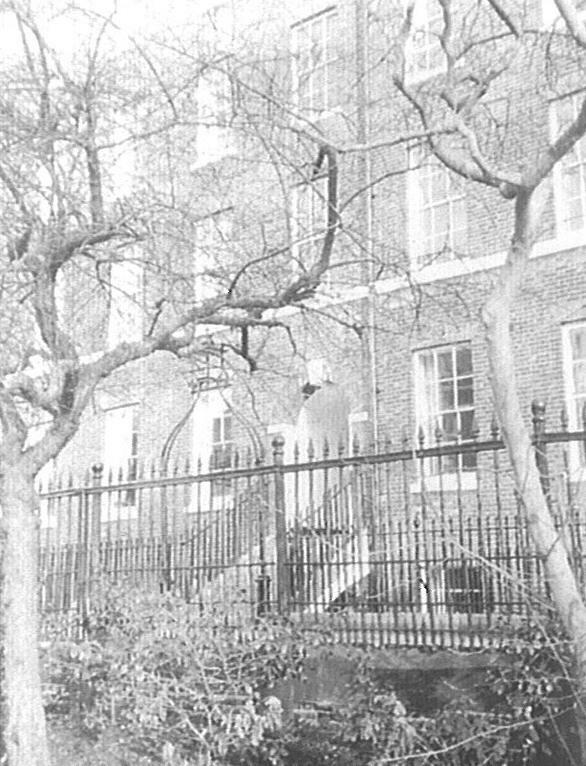 The 1679 building, which closely resembled those of similar date in King’s Bench Walk and Hare Court and was of red brick, filled with panelled rooms, was pulled down in 1875: perhaps (as Master MacKinnon suggested) the worst outrage inflicted by Victorian taste on the Inner Temple. Over the main doorway of its gaunt stone replacement are the initials and arms of the Hon. Adolphus Liddell, Treasurer 1875, and George Boden, Treasurer 1876. The present buildings were designed by Sir Hubert Worthington, R.A., to replace those destroyed in the Blitz. The foundation stone was laid by Queen Elizabeth II in 1952, the Hall was opened in 1955, and the whole range completed in 1958. On either side of the pegasus over the north entrance to the library are carved the arms and initials of Sir John Singleton, Treasurer 1952, and Sir Patrick Spens (later Lord Spens), Treasurer 1958; over the hall entrance is a pegasus with O T-1955, for Lord Oaksey. The Hall stands on the site of three earlier halls: that of the knights Templar (12th-14th centuries), the old hall built by the lawyers in the 14th century, and Sydney Smirke’s neo-perpendicular replacement of 1870. The terrace fronting the Hall and Library was considered in Georgian times the pleasantest part of the Inn, and it is still a fine prospect from the gardens. Only the parliament chamber (1680) and clocktower (1686) had survived the fire of 1737. The Georgian facade (in Portland stone) was added in 1740 when Thomas Blencowe was Treasurer. 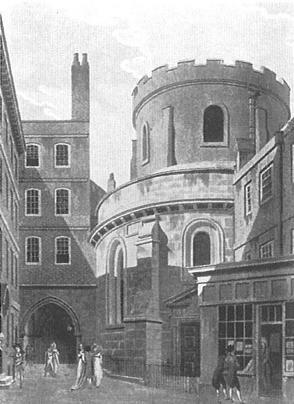 At the left is the Crown Office Row building of 1737 (destroyed 1941). The old hall underwent many changes before its demolition in 1868. None of the rich Elizabethan and Jacobean armorial glass seems to have survived. In 1816 a gothicisation programme by Robert Smirke brought an oak screen with pinnacles, a new ceiling, and wainscotting, with the readers’ painted coats of arms (formerly in the Parliament Chamber and Library) placed around the frieze; three statues of kings in terracotta, by Rossi, were erected in niches at the west end. For all this attention, it was too small and decrepit a building to survive. The new hall of 1870 reflected the same architectural taste, but was 92 feet long, and with much ornamental detail. 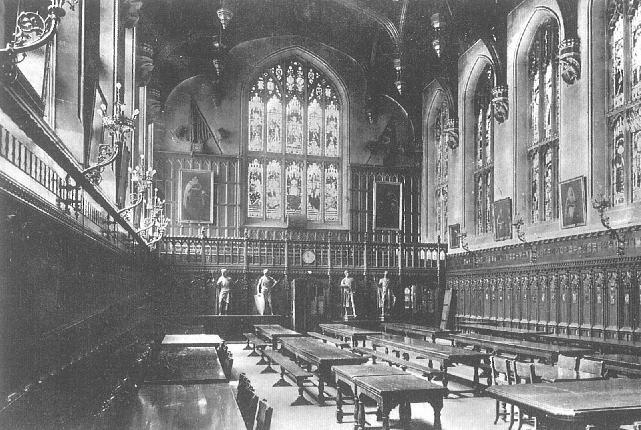 The windows included scenes from English history, such as the battle of Hastings and the Assize of Clarendon, pictures of Bracton (writing his book) and various other legal figures, together with historical personages from Alcuin to the Duke of Wellington; the great west window depicted Queen Victoria with four virtues representing Law and Government. At the east end was a marble bust of Queen Victoria, and (in the gable) Thornhill’s painting of Pegasus from the old hall. At the west end were two carved Elizabethan doors, one of them dated 1575; high above them hung the drums and colours of the Law Association Volunteers; and in 1875 were added at ground level four bronze statutes of knights Templar and Hospitaller, by Henry Hugh Armstead. Rossi’s kings were placed in the corridor and vestibule. Almost all of this perished in 1941. Also lost in the inferno were the old Treasury Office, Parliament Chamber and Benchers’ Rooms, which had been rebuilt in the 1830s and left largely intact by Smirke in 1870, with the insertion of an entrance on the south side in 1895. No attempt was made in the 1950s to reproduce the medieval appearance of the older halls, but a neo-Georgian style was preferred, with light coloured oak. The tradition was nevertheless continued of placing the readers’ coats of arms around the walls; the present shields were painted by Frank Newsome Berry. The armorial windows (mostly by Hugh Easton) commemorate members of the Inn who have held the great seal, two Royal Benchers who acceded unexpectedly to the throne (James II and George VI), and (in the west window) Robert Dudley, earl of Leicester. 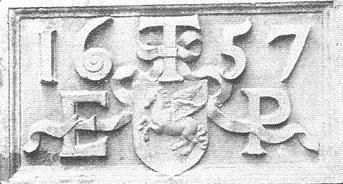 Dudley’s arms were ordered in 1561 to be displayed in Hall ‘as a continual monument of his lordship’s goodness and great good will towards this House’ in saving Lyons Inn from the claims of the Middle Temple. 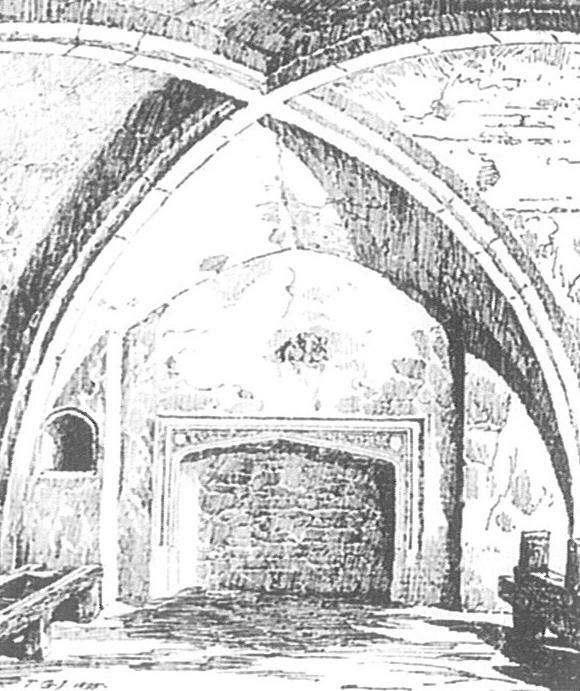 The old buttery and crypt at the west end of the Hall date from the fourteenth or fifteenth century, and are the oldest rooms still in use in the Temple. On a bracket over the fireplace in the crypt is an angel holding two carved shields of arms, which seem to represent Sir Peter Arderne (Chief Baron of the Exchequer 1448-62, d. 1467) and Brian Rouclyff (Baron of the Exchequer 1452-88, d. 1495). In the Parliament Chamber is a piece of elaborate wood carving, inscribed ‘T Thoma Walker Ar 1705′ and formerly attributed to Grinling Gibbons, which was removed for safety during the bombing. A carving of pegasus in marble by J. M. Rysbrack, made in 1737 for the Hall entrance, was also saved from the ravages of war and is now set above the benchers’ doorway opposite the Parliament Chamber. 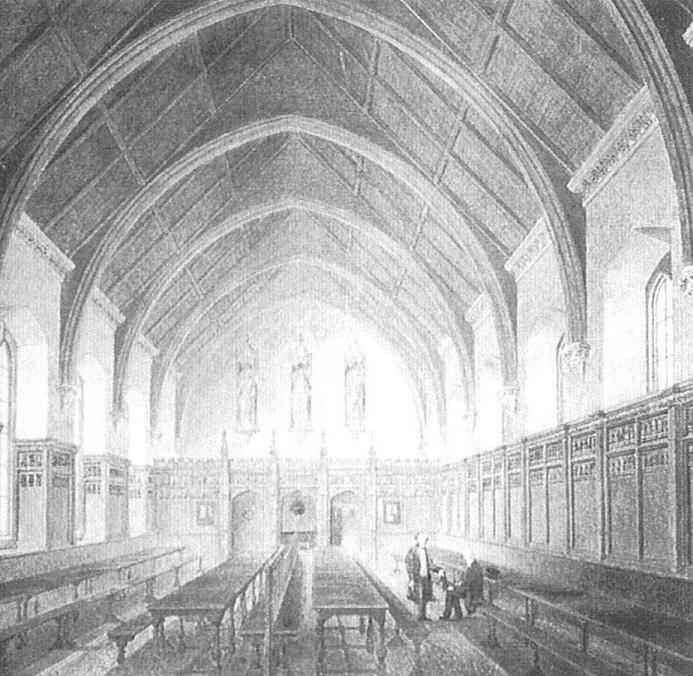 Most of the paintings belonging to the Inn were removed during the Blitz and still adorn the walls of these central buildings; they include the full-lengths of Coke and Littleton (given in 1662) which used to dominate the old Hall, and those of King William III, Queen Mary II and Queen Anne, commissioned by the Inn from Sir Godfrey Kneller (1694, 1702). 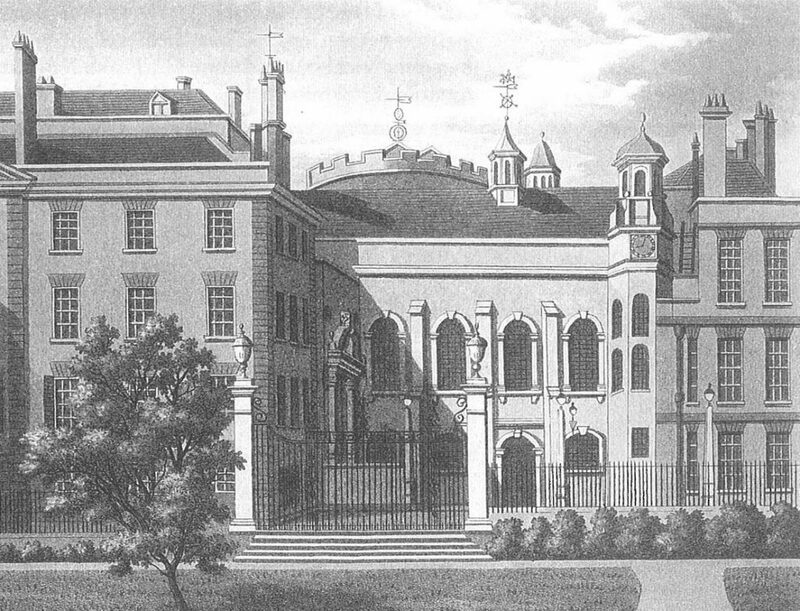 The first building on this site, formerly part of the gardens, was Heyward’s Building (1610). The present name, in use by the 1650s, described the timber and plaster ‘paper work’ of which it was constructed. Here John Selden had his chambers. They were rebuilt, in brick, in 1685; on the north end were painted frescoes of the Virtues, still to be seen in Charles Lamb’s time. Those buildings were destroyed in 1838 by a fire, which contemporaries attributed to the carelessness of William Maule K.C. (later Mr Justice Maule) in leaving a candle by his bedside. They were immediately rebuilt. No. 5 was added at the southern end, at right-angles to the main range, by Sydney Smirke in 1847-49. It is in an unusual style, with neo-perpendicular decoration, and bears the arms and initials of Thomas Starkie, Treasurer 1847, and George Chilton, Treasurer 1849. The name of this range recalls the Crown Office of the King’s Bench, which was located in the Inner Temple by 1542. Prior to the Blitz there were two buildings, the earlier (comprising Nos. 1-3) a classical building of 1737, and the other (adjoining it on the west) designed in an Italianate style by Sydney Smirke in 1864. It was in the former that Charles Lamb was born. Both were destroyed by enemy action in 1941. The present building was designed by Sir Edward Maufe, R.A. (1955). These are named after Sir Simon Harcourt (later Lord Harcourt), who was Treasurer when the original building was erected in 1703. They were rebuilt in 1832-33, and again after the war; the present buildings were designed by Sir Hubert Worthington, R.A. Over the doorway to No. 2 are a pegasus and the initials G|T 1955, for Lord Goddard. 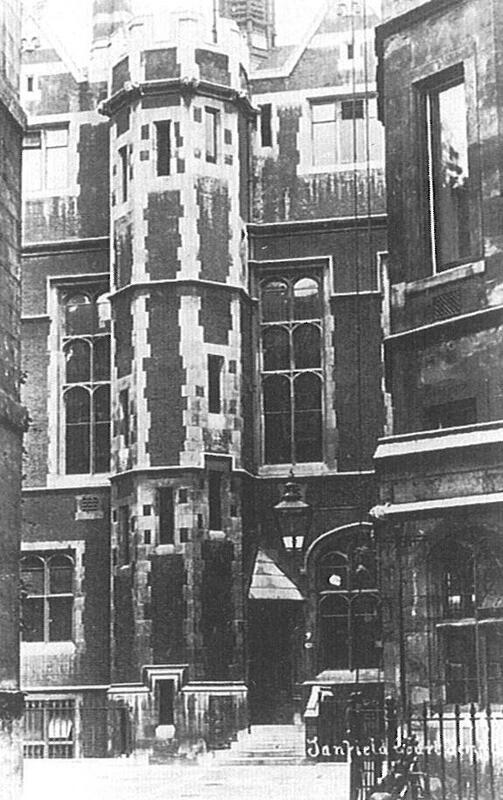 The chambers at the southern end of Middle Temple Lane (1875-79) were designed by Sir Charles and E. M. Barry so as to incorporate a grand gateway to the Temple from the new Victoria Embankment. Nos. 1 and 2, on the east side of the lane, belong to the Inner Temple. No. 2 has the initials AFOL 1875 (as on Farrar’s Building), and No. 1 has WHC 1879, for William Henry Cooke, Treasurer. The name of the Walk commemorates the King’s Bench Office (that is, the office of the chief clerk or master of that court), which was brought to the Inner Temple in 1621. The chambers on the east side are now known simply by their numbers in King’s Bench Walk. But they formerly had individual names: Serjeant Baldwin’s Building (No. 1); Finch’s Building (No. 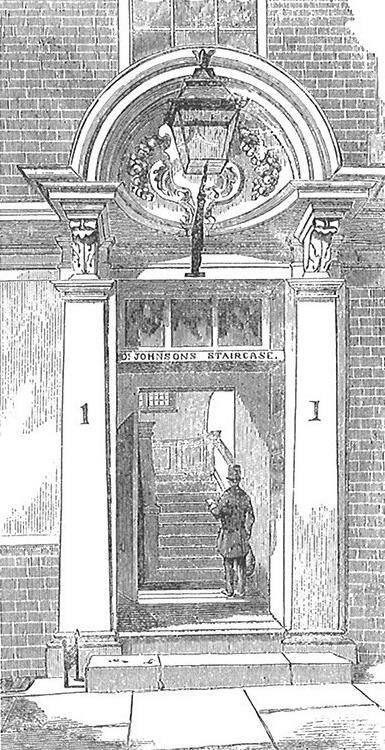 2), named after Sir Heneage Finch, later Lord Nottingham; ‘The Staircase next the Alienation Office’ (No. 3); King’s Bench Buildings (Nos. 4-6); Sir Thomas Robinson’s Building (No. 7), named after a chief prothonotary of the Common Pleas; Serjeant Hampson’s Building (Nos. 8-9); Minor’s Building and Minor’s Low Building (Nos. 10-11), named after a butler of the Inn. 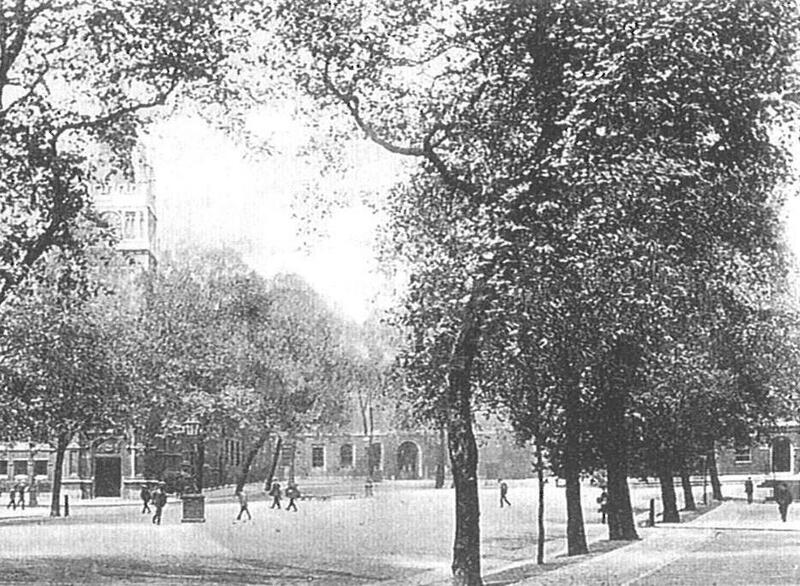 King’s Bench walk looking north-west, c.1900. Most of the chambers were rebuilt in 1678, following a disastrous fire in 1677, and the names refer to the investors in that work; some of the sets still have their original panelling. No. 4 has an inscription recording the fire and the rebuilding of 1678, when Richard Powell was Treasurer. No. 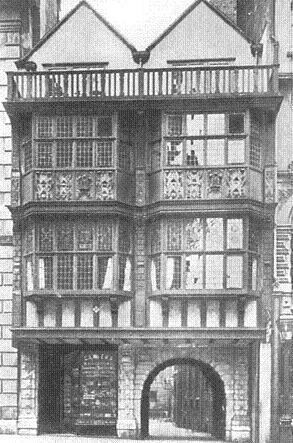 7 was restored after another fire in 1684, during which Sir Thomas Robinson died leaping from his window. No. 8 was destroyed by fire in 1781 and rebuilt the following year. Nos. 10-11 were rebuilt at the Inn’s expense in 1814; the monogram T ICH over the doorways is for Sir John Coxe Hippisley, Treasurer. Nos. 12-13 were added in a plainer Regency style, faced with stone; they were destroyed in the Blitz and reconstructed in replica. No. 6 and most of No. 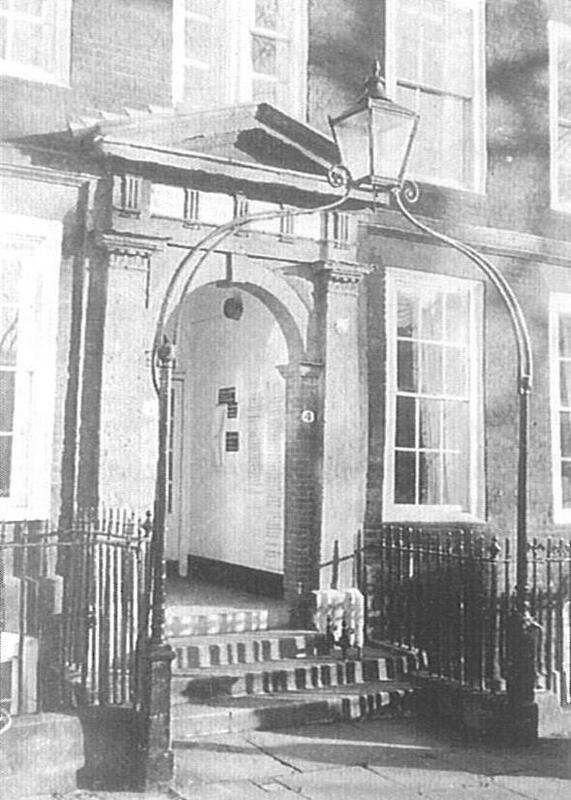 1 (apart from the doorway) were also rebuilt after the war. An inscription on No. 1 records that it was opened in 1946 by King George VI (Royal Bencher of the Inn) as a temporary library. This was built in 1957 to the designs of Sir Edward Maufe, replacing buildings destroyed in the Blitz. The site was formerly occupied by the Exchequer Office (1665, rebuilt in 1830) and part of Tanfield Court buildings (1881). Tanfield Court (on the west side of the range, now part of Church Court) was named after Sir Lawrence Tanfield (d. 1625), and was the scene of a notorious double murder in 1733. The name of the present building commemorates Sir Francis Kyffin Taylor, Q.C., later Lord Maenan (d. 1951), a bencher for 46 years. The inscription has the initials of Archibald William Cockburn, Treasurer 1959. These were built in 1830 on the site of the old Mitre Court Building (now No. 2) and Ram Alley Building (now No. 1), with an archway leading from Mitre Court into King’s Bench Walk. Over the archway is the name of Sir Alexander Croke, Treasurer 1830. No. 2 is a replica of the building destroyed in 1941; an inscription dated 1951 (with the initials of Alfred Bucknill, Treasurer) records the name of C. J. Conway, K.C., ‘for his devoted attention to the rebuilding of the Inn and the affairs of the society’. A still earlier building here was Fuller’s Rents, where Coke resided. The present name is taken from the court, which in turn was named after the old Mitre Tavern (no longer extant). Ram Alley was a narrow passage running into Fleet Street past Serjeants’ Inn. The Littleton Building stands on the site of the former Niblett Hall. The main part of the building is occupied by a set of chambers and the basement houses the Library’s non-law collections. The original building, Niblett Hall, was erected in 1932 out of a legacy from William Charles Niblett of Singapore, barrister of the Inn, as a lecture-room and meeting-place. The architect was Sydney Tatchell. It stood on the site of the Alienation Office Garden, named from the Office of Compositions for Alienations (established in 1577); at the end of the seventeenth century this became the Benchers’ Garden, laid out in the Dutch style with tulips, orange trees in tubs, and a fountain. 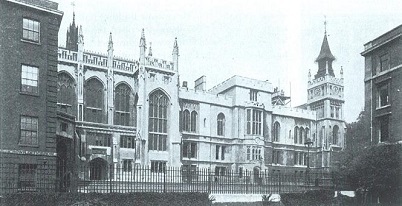 After the destruction of the main hall in the Blitz, the Niblett Hall served for fourteen years as a substitute. 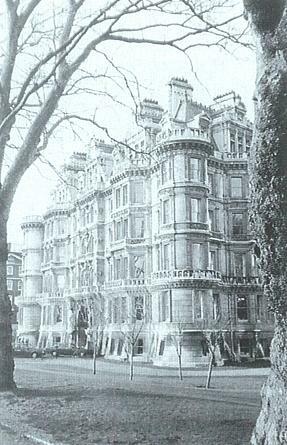 It was demolished in 1992 to make way for the Littleton Building.